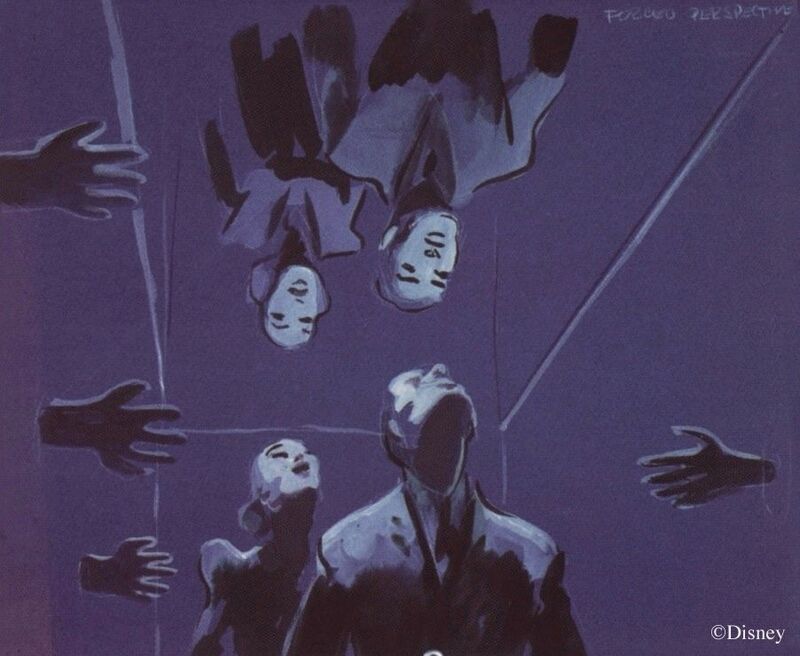 If you know anything about the Haunted Mansion's developmental history, you know about the Imagineers' difficulties in finding exactly the right mix of the frightening and the funny, but no one seems to notice that there was another, equally important balance that needed to be struck: the balance between Scary A and Scary B. After all, there is more than one kind of fear. When our guests aren't giggling, should the Mansion slowly give rise to an overwhelming sense of horror through the use of suggestion and eerie atmospherics, or should it pop things right into your face and scare the bleeding crap out of you? The choice is between (1) driving them slowly insane and (2) giving them heart attacks. Between two such worthy objectives there can be no easy decision. The tug-of-war between fear and fun has been given several clever names (Scary vs. Silly, Light vs. Fright, Kooky vs. Spooky). What should we call this other dichotomy? Nameless Dread vs. Severed Head? Too long. Chills vs. Thrills? Better. Hey, how about Brr vs. Boo? All in favor of that one, raise your hand. All opposed? I saw only one hand, and it was a yea, so I guess that means Brr vs. Boo wins. Isn't democracy great? The distinction between Brr and Boo is clear enough in theory but not always obvious in practice. There is a kind of gray scale between them. For example, you can create a tense situation with loud noises that brings the victim almost to the point of panic (Brr or Boo? ), and you can have ghostly manifestations that are so distant and detached that they aren't particularly alarming (Boo or Brr?). Nevertheless, gray scales do not disprove the reality and distinguishability of black and white. We all know the difference between the kind of fear caused by a sudden shock and the skin-crawling kind you get from a creepy environment. It's the difference between heart thumps and goose bumps, between mouths wide open in terror and eyes wide open in terror. It is also true that the two can coexist rather cozily. You can have a heavy atmosphere of foreboding providing the environment for a sudden scare, going from Brr to Boo in a flash. Think of the Attic scene before Constance moved in, when it was a dark and sinister place violently punctuated by that most quintessential Boo, the screaming pop-up spook. This whole preamble (less the digression) was necessary because I think we need something like the Brr vs. Boo tool in order to facilitate discussion of an unknown chapter in the development of the Corridor of Doors. The COD is a Brr masterpiece. * It's intense, and yet it's all about atmosphere. There are no visible threats. Nothing jumps at you. But did you know that the Imagineers at one point thought about scrapping this approach in favor of Boo? We'll get to all that, but if we're going to delve into the development history of the Corridor, it might be helpful to take another look at the original inspiration. What, again? Yes, again. Because believe it or not, folks, there's still a lot of juice left in that old lemon; and furthermore, we need to go past the details and get to lofty concepts and all that neat, heady stuff. Let's quickly review, and then start squeezin' anew. 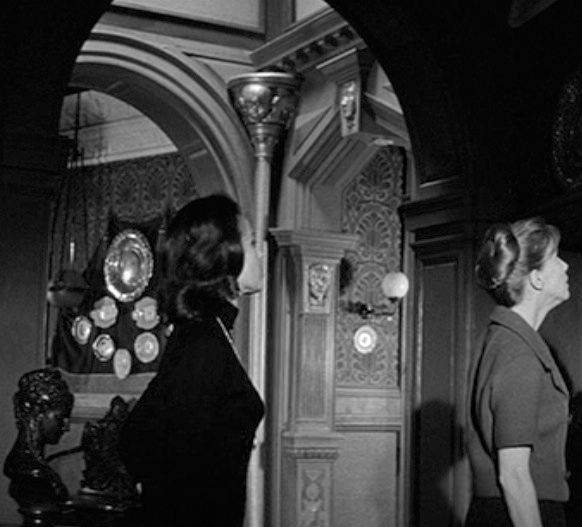 To begin, it is common knowledge that the bulging door gag in the COD was inspired by a scene in Robert Wise's 1963 supernatural thriller, The Haunting. inspired by the Hill House door, and the jambs of the doorway seem to be inspired by the distinctive door jambs seen in hallways of Hill House. 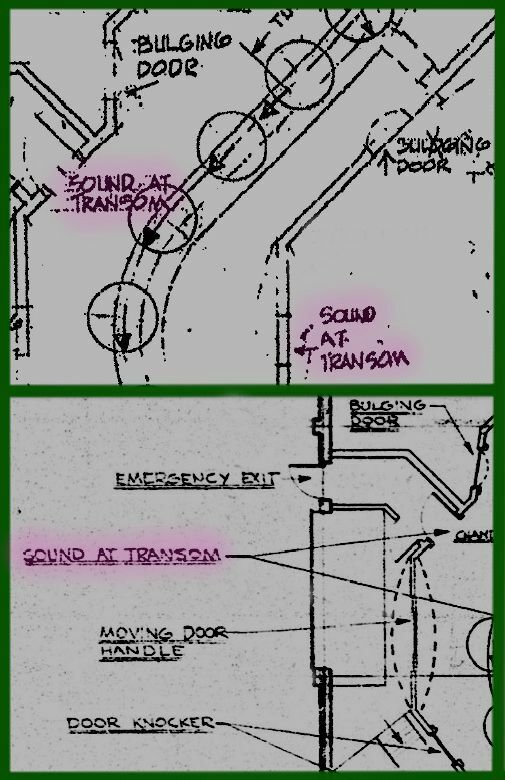 Going a step further, there are the pounding footfalls heard in the film, which probably inspired the very similar sound effects originally planned for the Endless Hallway and Corridor of Doors but were never used. 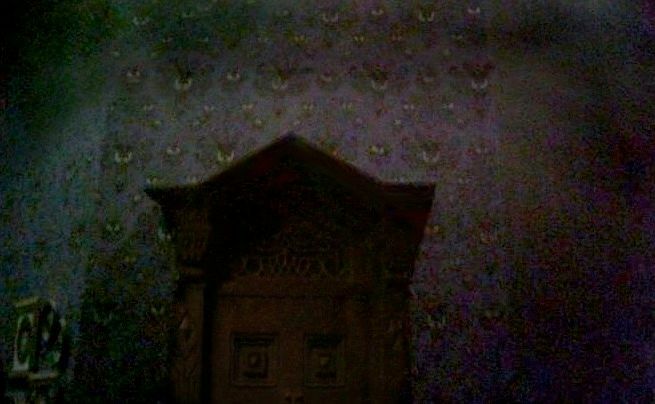 There has also been speculation now and then about the mysterious wallpaper in The Haunting, which may or may not have influenced the famous demon-eye wallpaper in the COD. So far the review. To date, that's as far as I've gone with The Haunting. Foxxfur over at Passport to Dreams has also explored the Haunting connection and took it several steps further in a January 2013 essay. 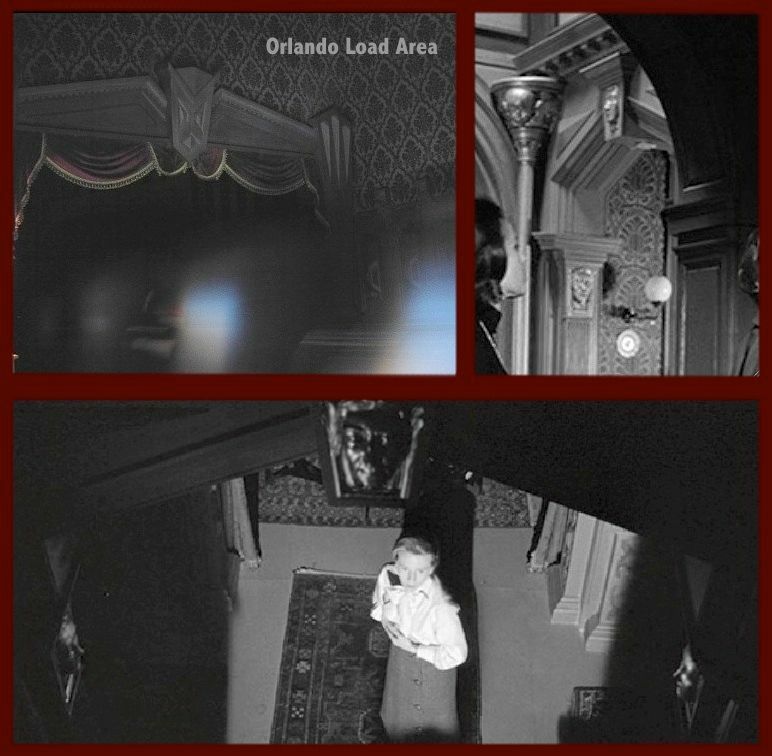 For her, the second floor of the Haunted Mansion presents us with something like a "comprehensive catalogue of frightening images from the Wise film." managed to escape earlier commentary: the jiggling doorknob gag. It happens twice in the film, actually. that makes it a pretty SNAKEY doorknob, doncha think? Take that for whatever you decide it's worth. that was more or less cloned for all the COD doors, including the doorknob jiggler type as well as the bulgarians. and the COD may go a wee bit beyond the naked gag itself. There is still more to be said about the influence of The Haunting. With our first new squeeze, we get this: the first time in the movie that the loud banging on a door occurs, the two female principals are inside the room, huddled in terror. At one point one of them perceives that the Noisy Presence is actually up at the transom, and the camera dutifully directs our attention there. The banging eventually stops and is succeeded by distant ghostly laughter, drenched in reverb. It's against the top of the door! It hardly needs to be pointed out that the COD also features loud banging and ghostly laughter (likewise drenched in reverb) . . .
. . . but it may not be quite as obvious that many of the individual sounds emanate from the tops of the doors; and furthermore, the transoms seem to have been chosen not simply as good, practical locations for the speakers but as a deliberate effect. The "effects" blueprints are careful to note this feature right alongside all the other effects. 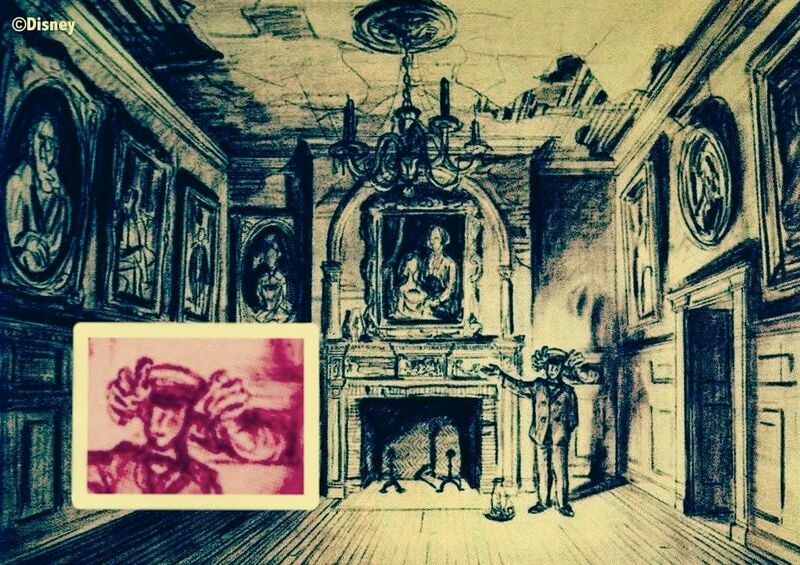 The locations of sounds elsewhere in the Mansion are not indicated. corridors of Hill House, unable to find the main dining room. Shortly thereafter, the leader of the group, Dr. Marquack, (excuse me, Marquay), explains why the house is so confusing, with what is supposed to be a profound rejoinder from ElluvaBore Eleanor. Sorry for the snark, but I absolutely can not stand the characters in this movie. There isn't a square corner in the place. The Corridor of Doors is just this way, of course, all crazy angles and inexplicable juttings in the walls, with doors facing in all sorts of improbable directions. We talked about this in the previous post. You are left with the impression that this area, like the hallways of Hill House, would be an easy place in which to get lost, and for the same reasons. I've saved this one for last, because I think it's the biggest and in some ways the best. The female characters in the film are "sensitives," and they're fond of saying things like "the house is alive" and "the house wants you." 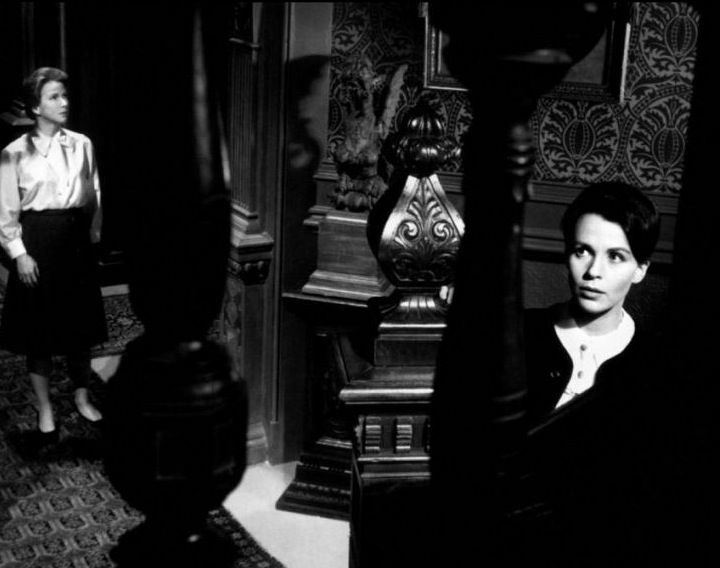 There is no attempt anywhere in Wise's film to draw a clear distinction between the house itself and the unseen presence haunting the house. The malevolent spirit may be spoken of as a more-or-less conventional ghost, a distinguishable entity named Hugh Crane, or one may dispense with such niceties and simply speak of the actual house as the malevolent presence—it's all the same, and logic be damned. It's not even completely clear whether or not there is only one spirit involved, although that seems to be implied most of the time. All of this ambiguity only cranks up the Brr factor that much more. The bulging doors in the COD have sometimes been referred to as "breathing doors," as if the house were alive. 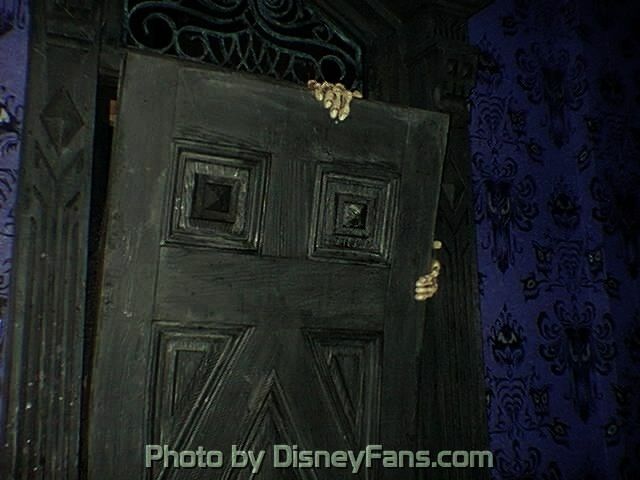 In fact, pre-opening press releases for the Haunted Mansion speak of the COD as a "hallway of demonized doors." Note that it doesn't say demons behind doors but demonized doors. I have argued elsewhere that the house itself acts as a surrogate body for the imprisoned spirits, and that's why it can appear to stretch and breathe and watch us like a living thing. I made no mention at the time of The Haunting, but clearly the metaphysics on display in the film are congenial to this reading. 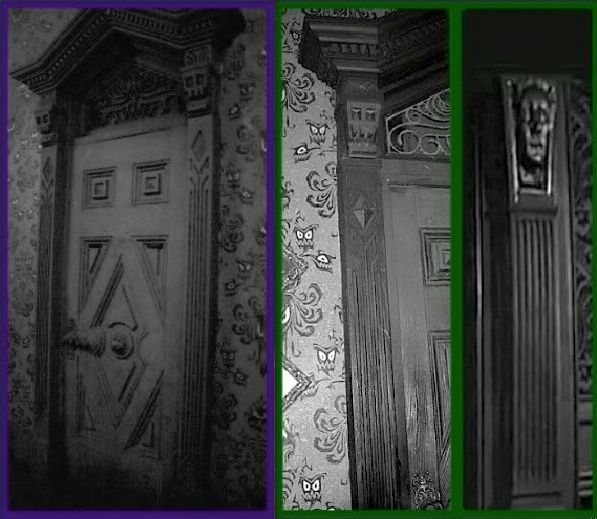 The above was all written in October and early November 2013, so it was quite the gratifying coincidence to hear a similar analysis of the resemblance between The Haunting and the Haunted Mansion from Jeff Baham in the November 15 podcast of his Doombuggies Spook Show. Incidentally, this interpretation might make better sense of the door knockers. The fact that the ghosts are "going the wrong way" with their door knocking seems somehow irrelevant if it isn't the spaces in the house so much as the house itself that is the sticking point for the frustrated spirits who want to materialize but can't. 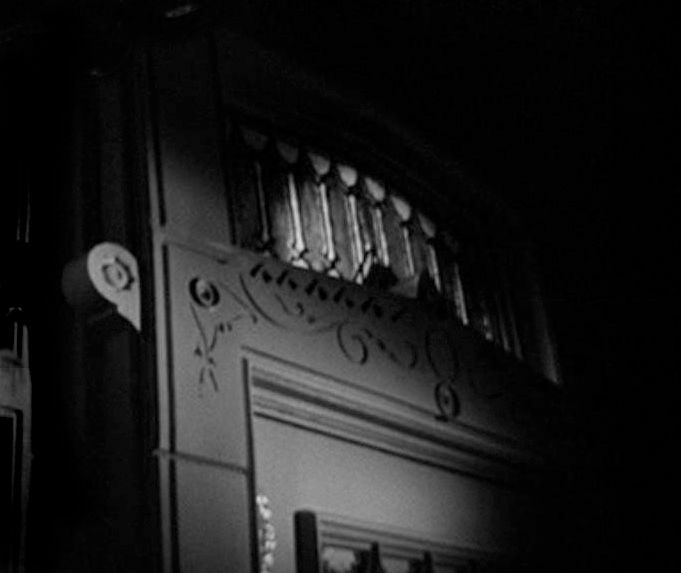 Wise's film is widely admired for its convincing presentation of a truly scary and genuinely haunted house without ever showing the audience a single ghost or even a single indisputably supernatural event other than the one experience of a bulging door—which is probably why that particular scene grips the audience's imagination so vividly. It is all done through atmosphere, nothing but sound and lighting and camera angles. There's only one genuine Boo in the film, and it isn't even a supernatural event (you know the scene I mean: the attic trapdoor thingie). In short, the film is celebrated precisely because it is such a pure and successful exemplar of the Brr approach to terror. 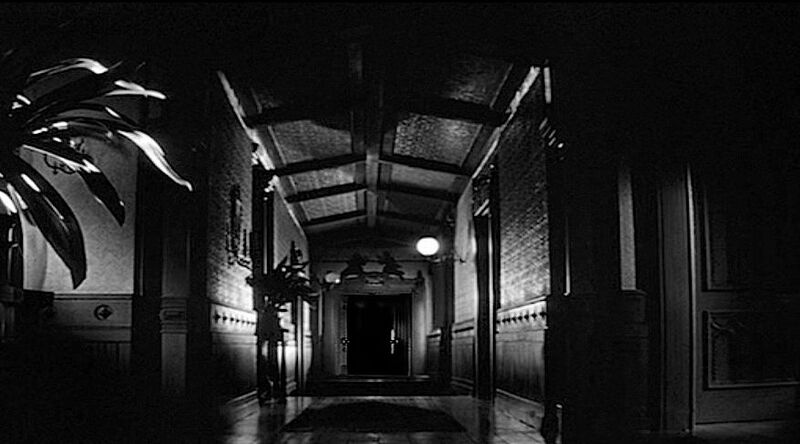 My purpose in returning to The Haunting was to underscore not only the breadth but the depth of the influence of that film on the Corridor of Doors. What I mean is that the COD is indebted to the film in both small details and grand concepts. We have documentary proof that a number of HM Imagineers saw the film together in a private screening, so you might be tempted to conclude that here is a case where the source material went almost straight into the ride without a ripple of dissent. But resist that temptation, because it's wrong. 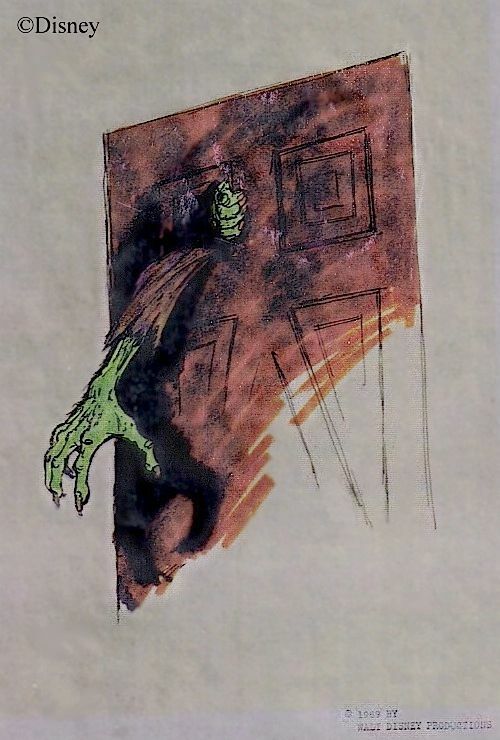 Marc Davis was not sold on using The Haunting as a template. Does this look like a Brr? It's obviously a concept sketch for the COD. What's interesting is that it was done after they had all seen The Haunting and after they had started pulling ideas from it for the ride. The design of the door gives that away. This is, of course, a Boo. You're suddenly frightened by the sight of an immanent threat posed by a dangerous Thing you can see right in front of you. Other than the great strength of said Thing, there isn't even anything supernatural here. 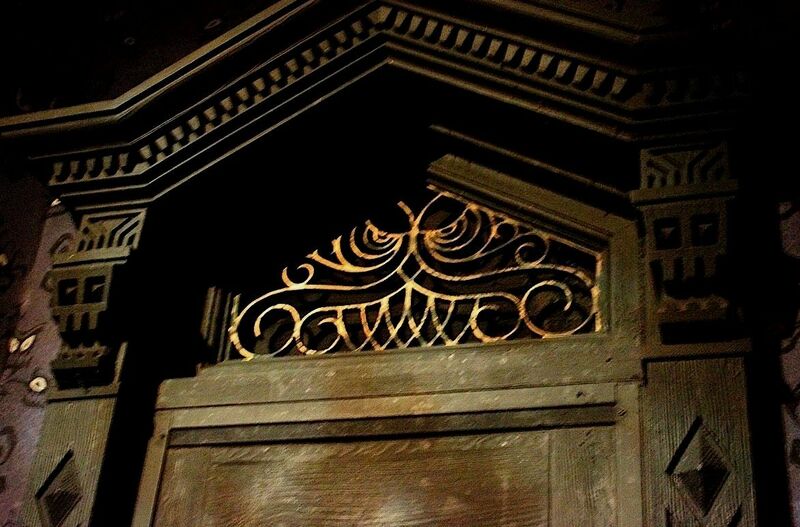 It's impossible to imagine this door in The Haunting. It looks more like something from the Addam's Family, albeit without the camp. That sketch was only one in a series. I don't suppose that many of you have ever seen these. Until now. Who loves ya, baby? We're mighty close here to a traditional pop-and-boo spookhouse. Even that last one, I think, is a Boo gag, although in this case a little more effort has been made to blend it into the environment. Despite that, the difference is huge. Wallpaper that looks at you is supernatural and profoundly unnerving; a guy peeking at you from behind a sliding panel is neither; it's just frightening. It's also a cliché. Hold on, not so fast. Maybe this was just another set of images produced quickly and without a lot of conviction, just some of the many ideas flung against the wall to see if they would stick. After all, Davis churned out dozens and dozens of sketches. He couldn't have been ideologically committed to all of them. Davis seems to have had a hard time sustaining a Brr atmosphere even in this creepy concept painting. Go up the left side of that hallway, and you've got an endless series of floating doors, not exactly threatening but surreal and hallucinatory, stirring up vague anxieties about getting lost in the Unknown, and all that. Brr city. 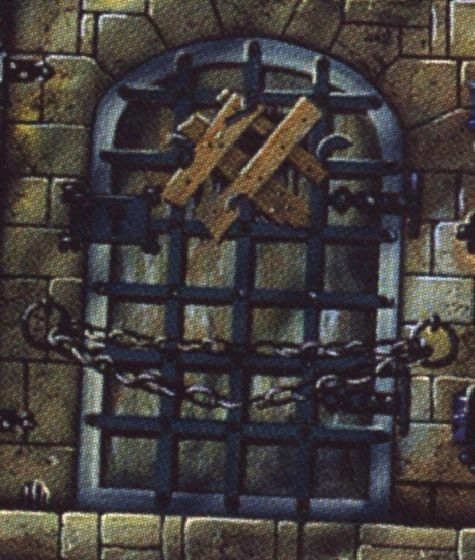 But on the right side we see that Marc was unable to suppress his gag reflex, and we've got a padlocked door bending out of its frame and another door featuring a human-shaped hole in silly, cartoonish fashion. Nope nope nope. They don't work. Not here. Those doors belong with that other set we looked at, not here in this twilight zone. Marc's deliberate shift from Brr to Boo in the sketch is even clearer if we accept a proposal made by Mr. Fenwright over at Micechat suggesting that the COD may have been inspired in part by a popular television show. I would bet my lunch money that many Forgottenistas are also part of that show's fan base. 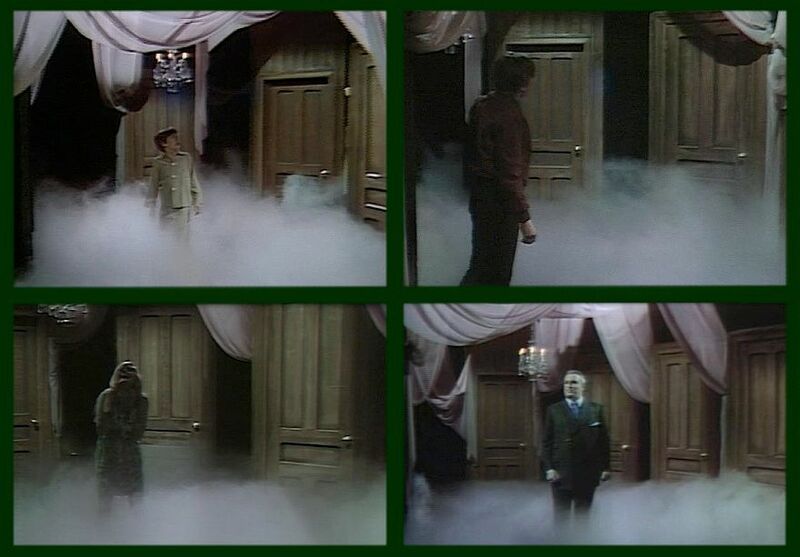 I would be genuinely surprised if the Mansion Imagineers did NOT have some acquaintance with Dark Shadows, and the "Dream Curse" sequence lasted long enough to be seen even by someone only casually checking in on the show now and then. I'm not so sure about influence on the final COD per se, but influence specifically on that Davis concept sketch seems like a distinct possibility. 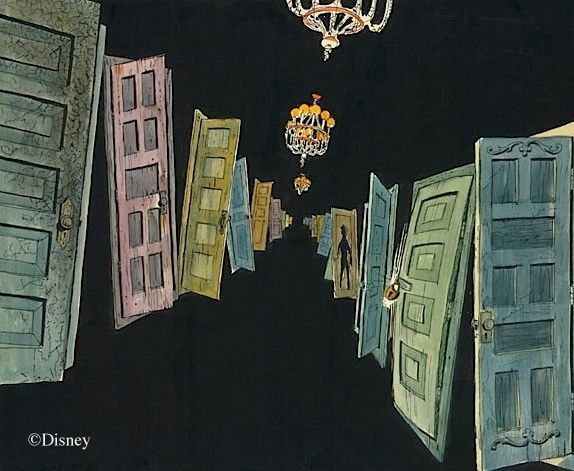 Note that like "The Dream Curse," Marc's sketch features a hallway of floating doors with only the blackness of nothingness between them, lit by hanging chandeliers. even the design of those chandeliers is similar. It falls well short of proof, but there is enough to at least be suspicious. If the sketch was inspired in any way by "The Dream Curse," it simply means we see Marc doing the same thing twice. He takes the door from The Haunting and draws a green goon smashing through it. He takes the floating doors from Dark Shadows and puts a rattling padlock on one and a Looney Tunes hole in another. Don't get me wrong. There's nothing wrong with Boo. Marc's doors would have been scary, and what Davis is here doing is nothing more than developing Ken Anderson's ideas. He and Marc were on the same page in this area. 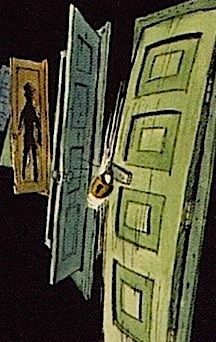 We recall that Anderson conceived of a hallway of "locked doors, too dangerous to enter" in his Ghost House, and when he actually got around to painting that sort of door for the Sleeping Beauty Diorama, he created something that comes from the same imaginative world as Davis's chained-up door. This was actually built. You have no zombie breaking through, but if you were around back then and got up close and looked through the peephole, you saw some of Malificent's goons in there staring back at you, thanks to a neat trick using tiny mirrors to reflect back your own eye as the "eyes" of the goons! That gag and Davis's sliding panel and peeping eyes are two chips off the same block. Anderson was fond of grabby hands, too. He was going to exploit this gag quite a bit in his Ghost House, even naming a recurring character after it, "Hairy the Arm." You will recall that Hairy was going to give your tour guide some difficulty. Anderson also gave some thought to grabbing at the guests themselves. Rolly Crump was one Imagineer who didn't think much of this Anderson/Davis approach. tremendous amount of fantasy." 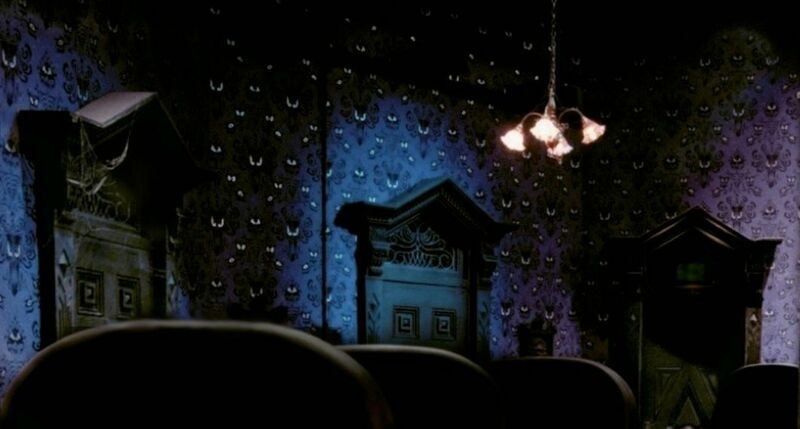 —Jason Surrell, The Haunted Mansion: From the Magic Kingdom to the Movies (NY: Disney, 2009) 26. 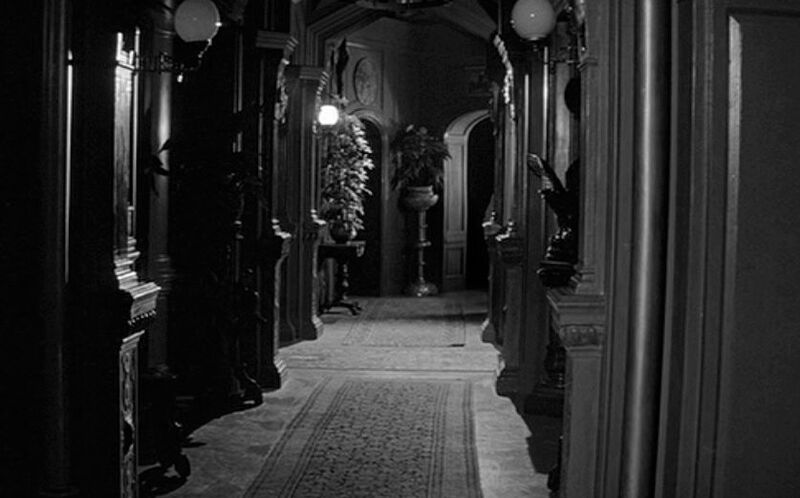 We know that part of that fantasy involved making the house itself seem to be alive, as in Cocteau's Belle et la Bête (1946). I would argue that at least that part of Rolly's fantasy was partially realized, even if the concept was adapted from the soberly conservative Haunting rather than from the phantasmagorical Belle. For all their differences, both films showcase a house that is supernaturally alive. One suspects that Rolly reacted positively to at least this aspect of Wise's film. 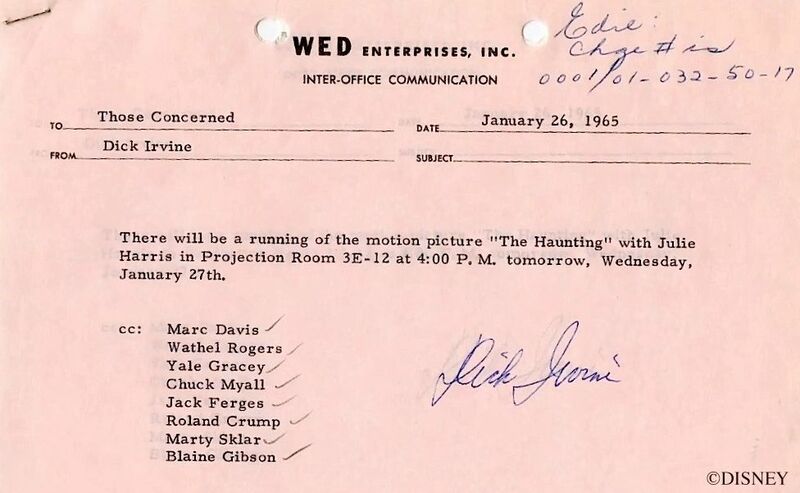 You have to think that Mr. Spooky Atmosphere himself, Claude Coats, did too, although he's not on the list of Imagineers who saw it at the private showing. The Brr vs. Boo issue may have been exacerbated by the decision to use a conveyance for the guests rather than leaving the attraction a walk-thru. As we all know, Bob Gurr's brilliant omnimover system solved the ride's logistics problem, but the doombuggies left no time for guests to soak up a story, room to room, and the elaborate effects so carefully worked out by Rolly and Yale Gracey had to go. I wonder if the Imagineers also worried that Gurr and Brr might not mix, that the system moved people too quickly for subtle atmospherics (or should I say, "atmosfearics"? No, I guess I shouldn't). 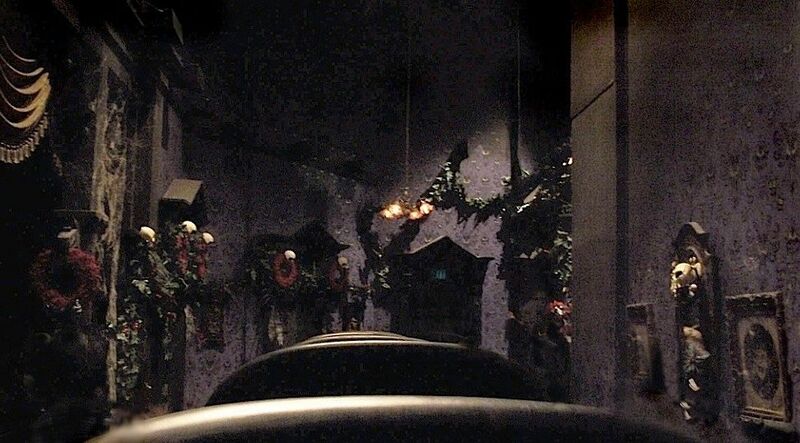 The omnimover system is obviously perfect for a Boo approach, but could people get creeped out by ambiance alone while being shuttled from scene to scene in a pod vehicle? We know the answer is "yes," but I doubt it was self-evident beforehand. It is true that Adventure Thru Inner Space did a good job sustaining a sense of awe and wonder throughout, but omnimovers seem like a natural fit for a science fiction setting. You would need some kind of pod vehicle to shrink down and enter a snowflake. In the Haunted Mansion, on the other hand, these pods would be passed off as some sort of "perpetual levitation" supplied by the ghosts, an iffier proposition to begin with. Whether omnimovers would cooperate in sustaining a tone of traditional supernatural terror in a haunted house environment remained to be seen. In any event, the Boo approach would probably have seemed the safer choice. 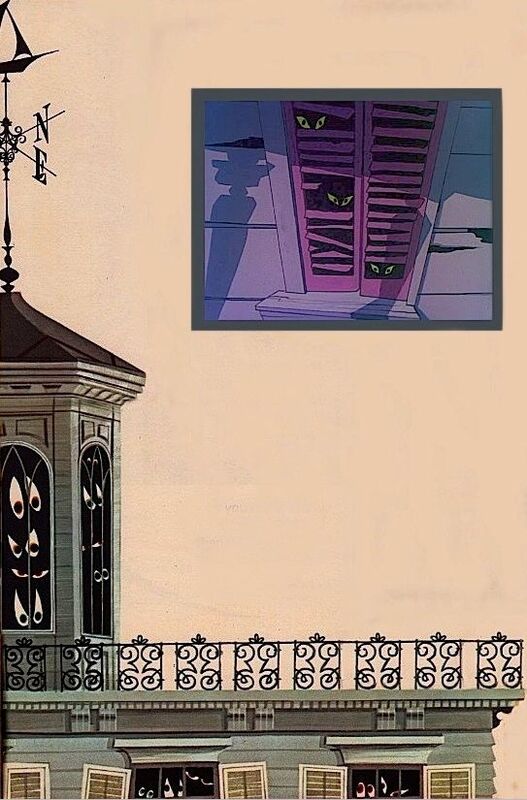 Another reason I think Marc Davis was a convinced Boo man is that by the time they built the Orlando Mansion, they knew that Brr worked well enough in the COD, and yet Marc finally got his way there with one of the doors. The moment you notice the hands you're startled and frightened. A desperate guy with superhuman strength is merely a few feet away and is likely to get through to you any second. Those are his hands, dude. Fear of the Known. Disneyland never had anything like this, and obviously there is nothing like this in The Haunting. 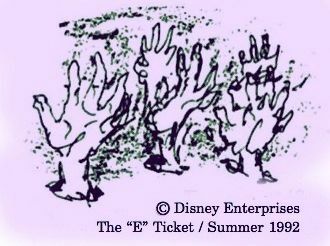 I realize this may not sit well with some WDW purists, but I've never liked the hands. They're an unnecessary Boo in an otherwise flawless and seamless performance of Brr. 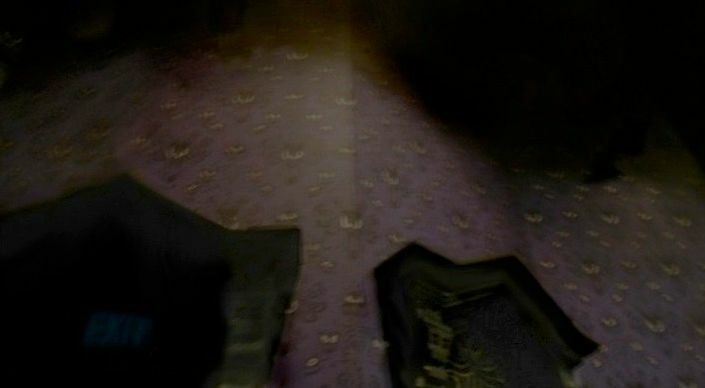 In an earlier post, I compared them with the hands on the Conservatory coffin, noting that it all implies that the house itself is a coffin from which the spirits wish to escape. But the two gags are also different. If a corpse came to life, everything you see in the Conservatory scene would make sense. No additional miracles are needed. An ordinary man might very well be able to push up the casket lid in his desperate efforts to switch to decoffinated. And obviously his frustrations are with that, not you. But who or rather what is this thing that is able to bend a solid wooden door? And what is motivating him to do it? Your presence? This is much more threatening. 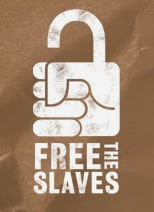 But it's not just the hands themselves. 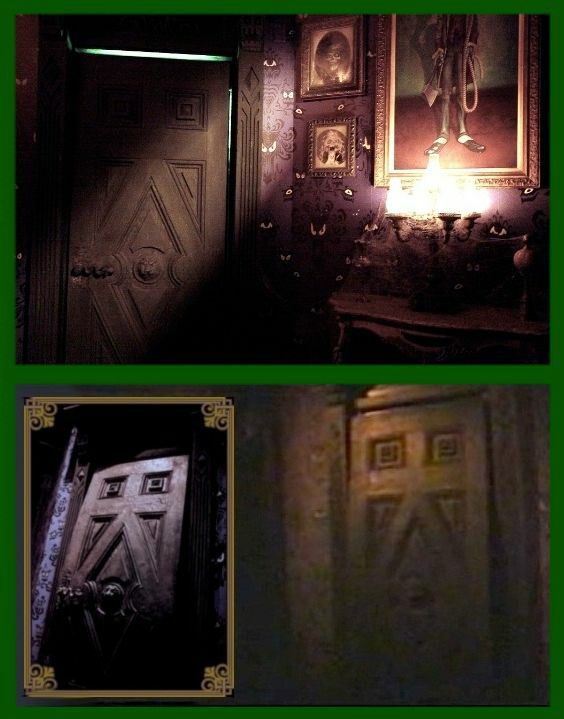 Precisely because of this effect, the other bulging door (there are two in the COD) has to be done differently than the ones in Anaheim if both doors are supposed to exist in the same reality. In the COD at DL the doors bulge out unnaturally but do not separate from the frames (they're latex). In WDW, Tokyo, and Paris, the bulging doors clearly do bend out of the frames. There's a green light back there to make sure you notice. That's a rather trivial variation, no? No. For me, the difference is immense. In the real world, a door this thick and solid could never bulge out like they do in Anaheim without some separation from the frame, but the others look the way you would expect them to look if an ox, say, or a rhinoceros were on the other side giving it his all. One is a miracle; the other tells you that something enormously strong is pushing on the door, which is remarkable but falls short of the miraculous. 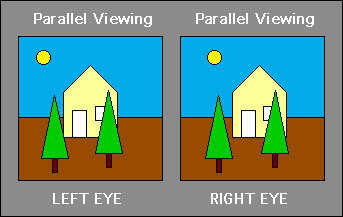 The effect of the effect is therefore quite different. 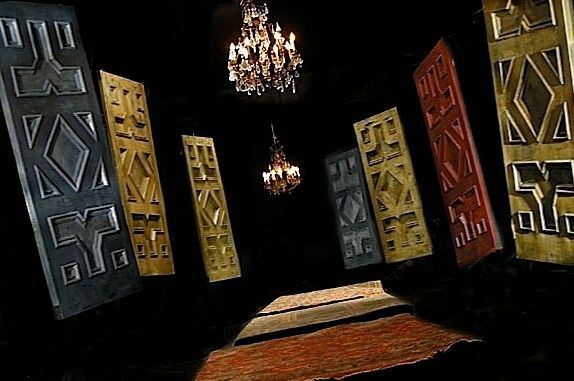 The DL doors are like the stretching room, eerie and impossible, a disquieting metamorphosis; the others are merely alarming. With them you're waiting for a snap and a crash as the door falls down flat before you. 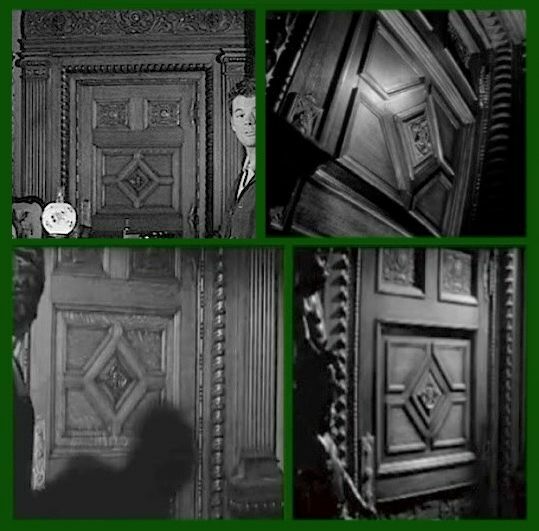 Very little resemblance to the door in The Haunting remains, in my opinion. class by itself, and it is far and away the best one. It would appear that Davis either changed his mind or had his mind changed for him by an opposing consensus among the Imagineers, who wanted to stick close to The Haunting. Ken Anderson would probably have been in Marc's corner, but Ken had been off the Mansion project for a decade. Marc didn't walk away from the table absolutely empty-handed, however. 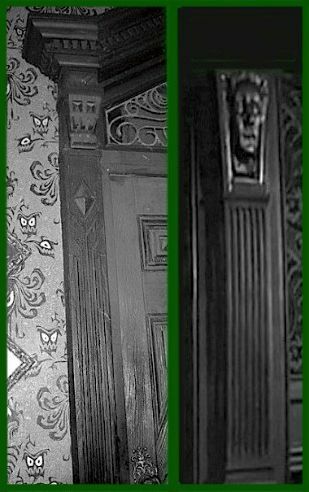 In addition to the unfortunate concession at WDW et al, shades of Davis's grabbing hand are still to be found in all of the Haunted Mansions, even at Disneyland. I mean literal shades: the shadow hand in the clock room. In earlier posts, I have argued that (1) the shadow hand was probably inspired by old horror movies like Nosferatu, and that (2) there isn't necessarily a creature behind you casting the shadow, because the shadow could be all there is. 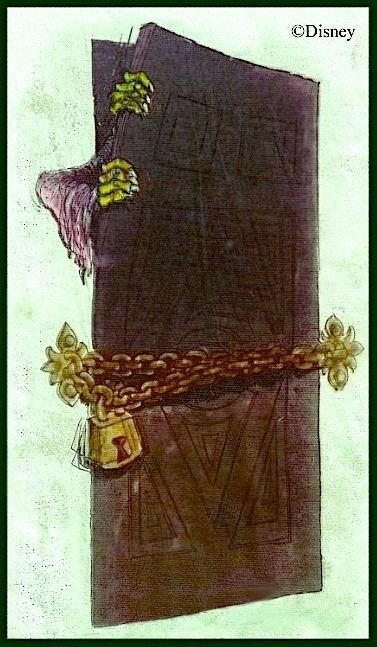 I'm not abandoning either claim, but it now seems undeniable that the more immediate inspiration for the shadow hand is to be found in Marc's sketches. Just take away the actual hand. of the gray area exactly half way between Brr and Boo, I can't think of a better one than this. * The COD is indubitably a Brr, but it's so good, perhaps we should call it a Brrrr. See how beautifully versatile this terminology is? pants, that's no ordinary Boo; that's a Booo. Four o's if you also soiled yourself. Five, they had to call 911. Six, you're now #1000.